U. Southern California, Ph. D.
Inorganic Chemistry: Mechanisms of inorganic redox reactions in solution. 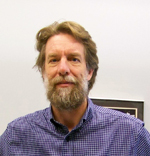 Dr. Stanbury's research is concerned with the mechanisms of inorganic redox reactions in solution. Recent areas of interest include the reduction of O2 by Fe(II) complexes and the oxidation of phenols thiols by various transition-metal complexes. Motivation for the work comes from applications to energy technology, environmental remediation, and understanding biochemical reaction mechanisms. The O2 research is motivated by the need to develop effective catalysts for the reduction of O2 to water, which is needed for useful fuel cells. In the current research we are investigating Fe(II) complexes that have a labile coordination site to facilitate the bonding to O2. An inner-sphere mechanism is essential for such catalysts, because a substitution-inert reductant would necessarily reduce O2 to O2– or HO2, and formation of these oxygen radicals imposes an energetic barrier tht is much too high. The phenol research entails studies of oxidation by substitution-inert metal complexes. These oxidants cause phenol to be oxidized to phenoxyl radicals, and in the process the phenolic proton is transfered to the solvent. Reactions such as these are known as PCET reactions (Proton-Coupled Electron Transfer). Phenols are particularly important to study in this context, because of the essential role that PCET of tyrosine (a phenol) plays in the functioning of ribonucleotide reductase, photosystem II, and cytochrome c oxidase. Our studies of thiols parallel those of the phenols in the sense that we use substitution-inert oxidants to enforce an electron-transfer mechanism that generates thiyl radicals. However, differences abound. 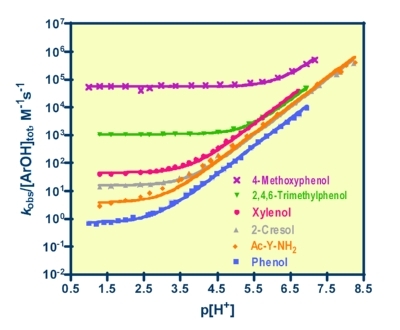 For one thing, these thiol oxidations are highly susceptible to catalysis by submicromolar concentrations of copper ions. Also, we are finding that the reactions invariably proceed through prior loss of the thiol proton; it is the thiolate species that actually undergoes oxidation. In contrast, phenols can react through their phenolate forms, but they can also be oxidized directly.